Dr Ramzy is passionate about helping his patients to feel better and more confident as a result of having a healthy smile. As a big believer in preventative dentistry. Dr Ramzy has over 30 years experience as a dentist, and during this time he has developed a passion for educating his patients about the importance of taking care of one’s oral health. Dr Medhat Ramzy is the principal dentist atMaven Dental Brunswick dental practice which he established in 1996. 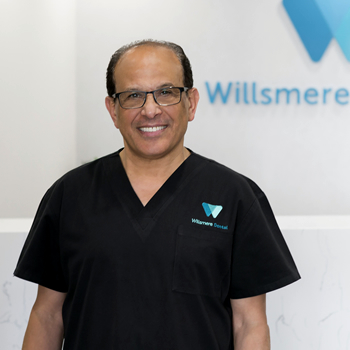 Willsmere Dental has been many years in the making and was established by Dr Ramzy in 2017. Opening a practice with his family has been Dr Ramzy vision for some time. Dr Ramzy loves seeing many families, he also likes being able to work with his family at the practice. At Willsmere Dental Dr Ramzy is joined by his wife, Dr Mona Ramzy, his son Dr Anthony Ramzy (who are both dentists), and his daughter, Monica Ramzy, is an oral health therapist. While it also can be considered a science, dentistry has an artistic aspect to it that Dr Ramzy finds compelling. “I have a passion for being creative and particularly enjoy cosmetic dentistry and seeing the incredible transformations in patients’ confidence.” For him, seeing so many satisfied patients makes dentistry worthwhile. Dr Ramzy completed his dental qualifications (B.D., M.S.) from Cairo University in 1980, before going on to obtain his Diploma of Conservative dentistry in 1984. He moved to Australia in 1987 and received his A.D.E.C certificate in Melbourne in 1989. Dr Ramzy established the dental service in B.C.H.C in Brunswick before starting his first private practice in 1991. He has furthered his education by taking numerous professional development courses over the years. Dr Ramzy is highly experienced across all areas of dentistry, he has over 30 years’ experience in cosmetic, restorative dentistry, root canal treatment, bleaching and prosthodontic dentistry. He also has particular interest in orthodontics and he is a licenced provider of Fastbraces®. He also has his licence to provide dento-facial injections from the AADFA (Australasian Academy of Dento-Facial Aesthetics). Outside the practice, Dr Ramzy enjoys creating art, especially drawing and painting. He also plays indoor soccer on the weekends. “I love the English Premier League but watch all soccer games.” He’s also a supporter of the Essendon Football Club. Dr Ramzy displays his artistic side in the kitchen, as he enjoys cooking; his signature dish is Chicken Parmigiana. Dr Ramzy accommodates to a diverse patient base as he speaks English, French and Arabic. Dr Ramzy and his team have over seven decades of experience and the most advanced technology available, Willsmere Dental is committed to delivering the most attentive and efficient dentistry to our patients. Contact us to find out more about our late night and Saturday appointments. Same day appointments are often available. Contact us today or request your appointment online.